The Six of Pentacles is what I sometimes like to refer to as the “Yule” card. In times gone by the richer families would slaughter their cattle in winter, keeping only the strong ones alive for springtime. They could not of course eat all the meat from the winter slaughter, so shared this with the less fortunate families. In some ways I guess these richer families represented a kind of Santa Clause to the families who had none and who depended on the charity and generosity that their wealthier neighbours would show them. The scales in the card symbolises measuring out the bounty in equal shares to ensure that everyone got some. While there was enough, they had to ensure that nothing went to waste. In return, the wealthier families could depend on the loyalty of the less fortunate to help in spring when crops needed to be planted and tended, because when winter came the less fortunate knew that they could rely on the wealthier families for food. As long as this healthy balance of give-and-take was maintained it would continue to work well. Interdependency rather than co-dependency was the key. The number six in the card could refer to the family unit, the tribe or community, as is the case in numerology. All working to support one another and to look out for each other. 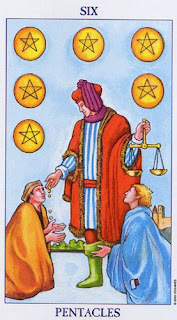 This card speaks strongly of the need for an equal exchange of energy. We all give of our time and share our resources, but are we wise enough to ensure that the real gift we give is one that empowers those who receive our gifts rather than keeping them indebted to us or unable to help themselves? Mikao Usui Sensei, founder of the Reiki system of healing taught that in order to truly help others we need to teach them to help themselves. Expecting an equal exchange of energy keeps all parties accountable and responsible. If however the balance is disturbed by giving without expecting anything in return, beneficiaries are often not empowered and soon return to their former situations without the understanding that they have a responsibility towards themselves to change their less fortunate circumstances which is within their reach to do. When reading through the bible, the word ‘charity’ can often be exchanged for ‘love.’ If we love others we would want to see them lift themselves out of an impoverished situation and into something more empowering. Therefore we need to exercise wisdom and be discerning in our charity by guarding against perpetuating a situation that could contribute towards keeping others entrapped in indebtedness and helplessness. I am not necessarily speaking about world hunger or poverty here, instead I am referring to our daily ability to be charitable towards our fellow man, family, loved ones and community, and towards those who look to us for guidance and answers. A Chinese proverb teaches: Give a man a fish and you feed him for a day. Teach a man to fish and you feed him for a lifetime. That is the kind of charity that I am referring to, giving of ourselves to empower others to give to and of themselves who empower others in return. In that lies an equal exchange of energy, devoid of resentment, indebtedness and helplessness. In closing I share with you the words of Ralph Waldo Emerson, who said: "It is one of the most beautiful compensations of life that no person can sincerely try to help another without helping themselves." Very nice, Rootweaver. Thank you. And I like what Ralph says. Helping may be, in a surprisingly and powerfully humbling way, the greatest helper we'll ever know.